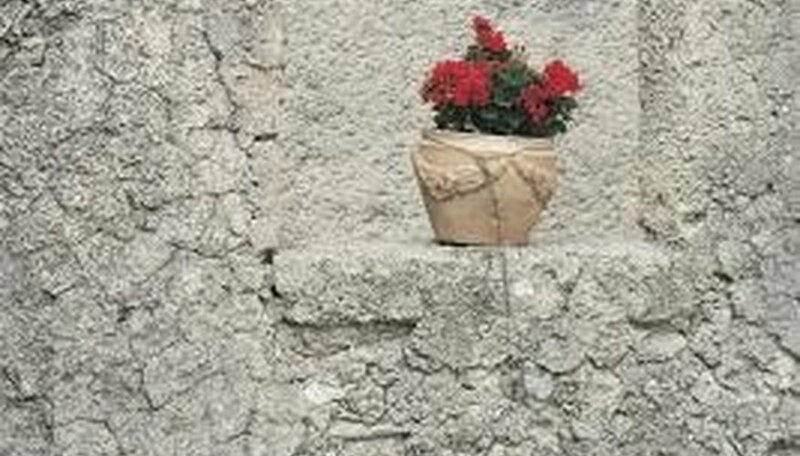 Stone planters add a touch of Old World charm to any home, but cost considerably more than plastic or terra cotta pots. For one or two special planters, this may not be an issue, but if you like the idea of multiple pots and planters adorning your deck or yard, purchasing stone planters simply may not be feasible financially. But that doesn't mean you can't create a faux stone finish to liven up those mismatched pots and containers. Wash your plant pots in warm soapy water to remove any traces of soil or plant debris. Scrub lightly with an abrasive cleaning pad if crusty deposits resist your efforts. Rinse the pots with hot water and allow to air dry. Plastic pots can be wiped dry with a soft cloth, but porous pots, such as terra cotta, need air drying to remove all moisture. Place them in the sun for several hours until completely dry. Cover your work area with old newspapers. Set the plant pot in the center of the newspapers. Coat the outside of the pot with a clear sealer to prime the material. This seals the surface and prepares it for a good bond. Refer to the manufacturer's recommendations when choosing a sealer for your project. Shake the can of spray paint to mix the paint well. Hold the can 10 to 14 inches from the surface of the plant pot and spray a thin even coat. You can always add a second coat, if you desire more coverage.Two thin coats are preferable to one heavy coat. Repeat the procedure until the entire pot is covered, turning the pot as you go. Allow the plant pot to dry to the touch before applying a second coat of paint, if needed. Seal the faux stone finish with a coat of clear sealer once it has dried completely. Allow to dry over night and fill with your favorite plants and display either inside or out. Select the style and color of stone finish you prefer. Several manufacturers provide a range of colors and textures than range from faux white marble to deep sandstone. Spray paint when temperatures are between 50 and 90 degrees Fahrenheit. Always read the manufacturer's directions when applying textured finishes. Do not spray use spray paint when humidity is above 85 percent or in windy weather.